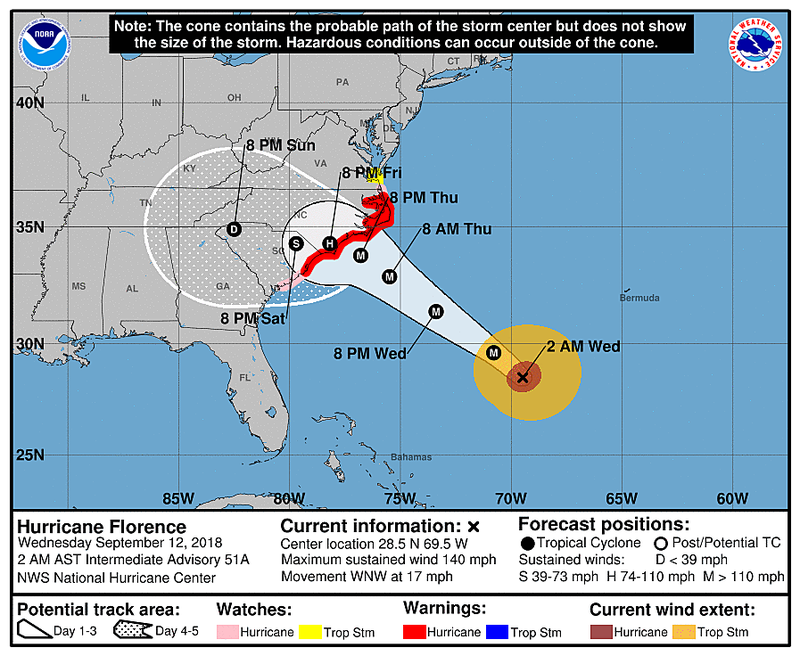 As of 5 a.m. Wednesday morning, Hurricane Florence was centered just 575 miles southeast of Cape Fear, NC. Still a category 4 major hurricane packing 130 mph winds. The Carolinas are bracing for tropical storm conditions Wednesday night, and even more intense weather and surf Thursday into Friday. It's going to be a very, very bad situation there. Your Wednesday is starting out foggy. Visibility is at or below a quarter-mile in many spots, which is the threshold for dense fog. 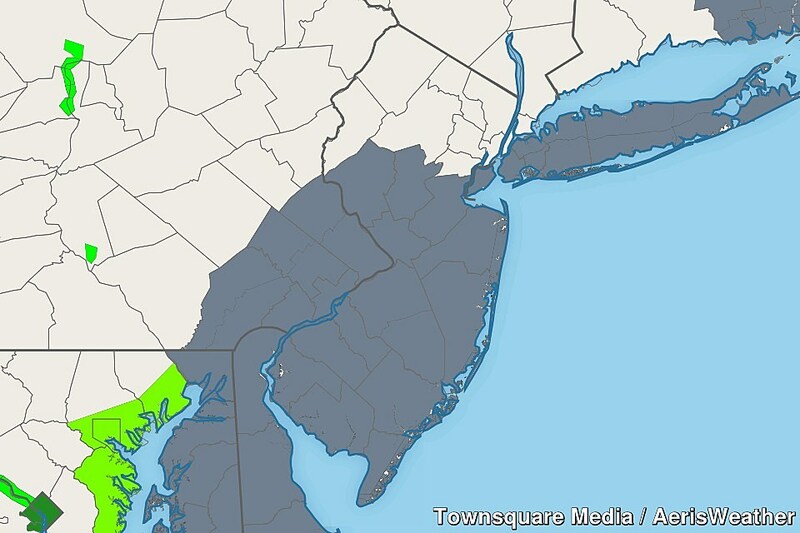 A Dense Fog Advisory has been issued for central and southern New Jersey until 10 a.m. This includes the following 13 New Jersey counties: Atlantic, Burlington, Camden, Cape May, Cumberland, Gloucester, Hunterdon, Mercer, Middlesex, Monmouth, Ocean, Salem, Somerset. Current advisories from the National Weather Service. Grey = Dense Fog Advisory. So be sure you slow down as you head out. Use low-beam headlights (and fog lights if you have them). And, as always, watch out for the deer. The fog is going to hold on for much of the morning, with significant gains in visibility expected after about 10 a.m. Wednesday afternoon will be mostly cloudy. A stalled front in the neighborhood looks to spark a few spotty showers and thunderstorms throughout the day too. High temperatures will be similar to Tuesday's, in the upper 70s to around 80 degrees. The chance for widely scattered showers will continue for Wednesday night. And, given the humid atmosphere, another round of fog seems likely overnight. Low temperatures be somewhat sticky, near 70 degrees. Thursday actually looks mostly dry. Sunshine will remain limited, and we could see an isolated shower at some point. High temperatures are once again forecast to reach the upper 70s to around 80. 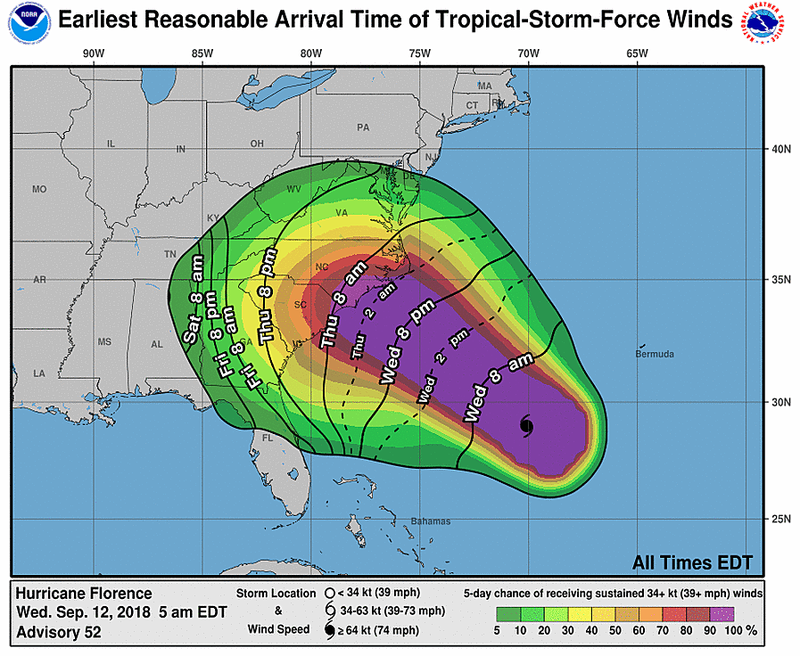 On Friday, Hurricane Florence will make its closest pass to New Jersey. The latest forecast models have actually suggested the storm will wiggle slightly to the south as it stalls over the North Carolina coast. I suspect that trend is because of the strength and breadth of the protective dome of high pressure over the northern Atlantic that steered Florence away from us. Notably, that subtle southward shift provides extra confidence that New Jersey's impacts from Florence will indeed be minimal, as we barely end up on the northern edge of the storm. 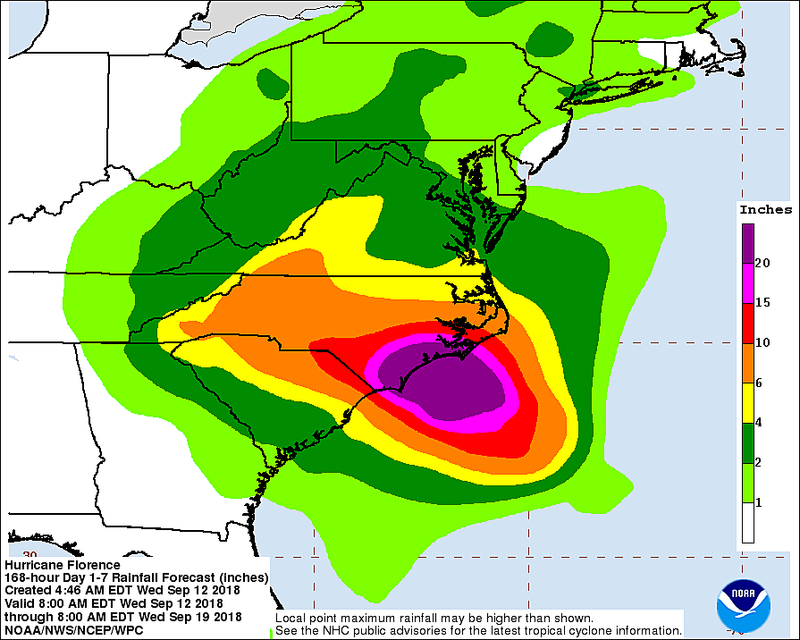 --SURGE: 9 to 13 feet, leading to catastrophic flooding, especially along the Outer Banks and tidal rivers. --RAIN: 20 to 30 inches, with isolated 40 inches possible. --WIND: Hurricane conditions, up to 130 mph (with gusts to 170 mph). --SURF: 12+ foot breaking waves with life-threatening rip currents. --SURGE: Maybe a foot, which could cause minor flooding of low-lying areas adjacent to tidal waterways. --RAIN: Depending on the exact size and speed and orientation of the storm, a rain band may drift into South Jersey on Friday, but should remain light. If it rains at all, we could see a half-inch to an inch tops. --WIND: Breezy on Friday, with easterly gusts over 30 mph possible along the Jersey Shore. --SURF: Rip currents and rough surf already occurring, with waves up to 6 feet. So Friday is going to be a breezy, cloudy, and possibly damp day. That's about it. Far from the brunt, as promised. With Florence expected to stay far away from New Jersey, the weekend forecast optimistically looks very good! Skies will clear on Saturday, and my forecast contains mostly sunny skies for Sunday. High temperatures will range from the upper 70s to lower 80s. I'm keeping the weekend dry for now — again, an optimistic outlook, but let's keep fingers crossed it will be pleasant for a chance! Finally, we have to talk about the potential return of Florence. Yup, the potential is very real that we get another shot of Florence-related rain next week. As the storm pushes inland over the Carolinas, it will get caught up in the west-to-east jet stream and make a big U-turn through the weekend. As it does, the topography and lack of warm ocean water will tear the storm apart, turning it into an extratropical shadow of its former self. I've seen several solutions of when and how that tropical moisture returns to the East Coast. 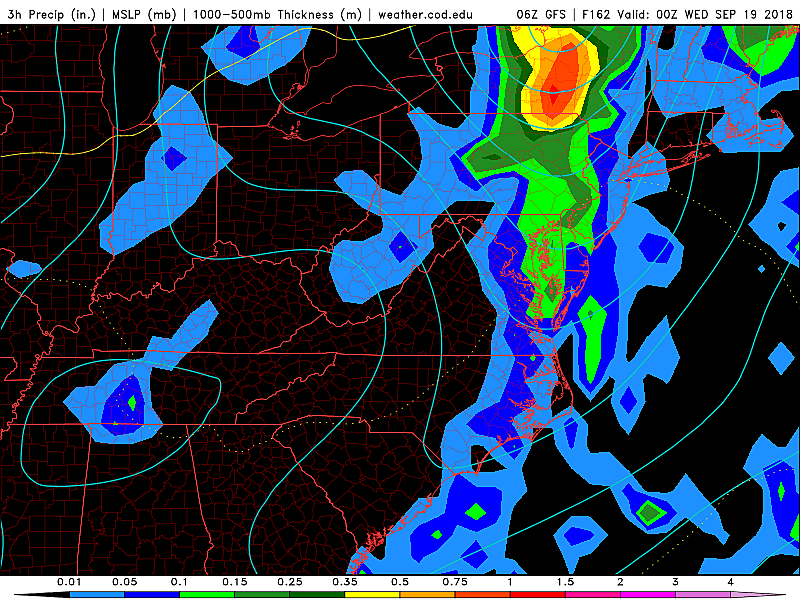 The latest GFS model shows about an inch of steady rain in New Jersey from Tuesday afternoon to Wednesday afternoon. Previous GFS models were more dramatic, with 3 to 4+ inches of rain. The Euro model shows some torrential rain passing south of New Jersey next Monday-Tuesday. Meanwhile, previous model solutions have shown the remnant rainfall missing the Garden State to the north. What does all that mean? Low confidence, of course. Lots of options, little resolution. For now, we'll have to watch how the storm tracks as it makes landfall. Once it goes extratropical (i.e. "feeding" off the atmosphere, rather than the ocean) we'll have a better idea of when and where the residual rain will go. The multiple inches scenario could cause some pretty significant flooding, so this potential is absolutely worth watching next week.